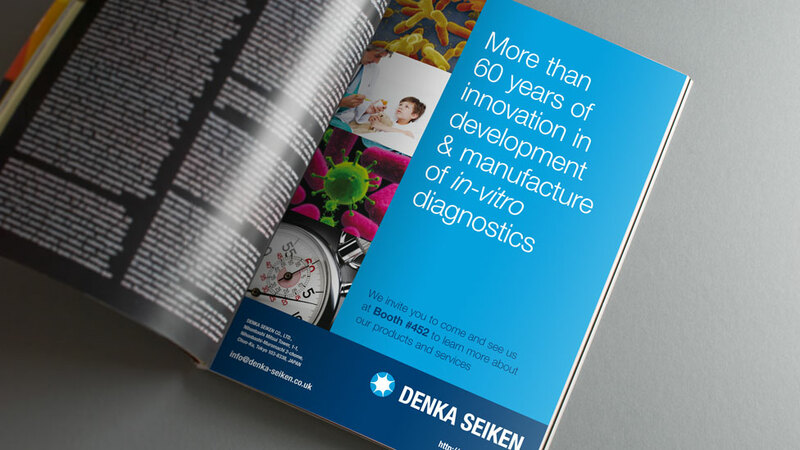 When Denka booked their exhibition stand at the Medica exhibition they received a complimentary advertising space in the show handbook – a great opportunity to develop a simple and effective medical advertising campaign. The advert had to convey the scope of the client’s product offering and the experience they have in developing, manufacturing and distribution of high quality in-vitro diagnostic equipment. Utilising the existing Denka Seiken colours and brand elements we created an advert that communicated all the client requirements. At the same time, we ensured it would be easy for the reader to digest in a few seconds, to provide them with a reason to visit the stand on the day of the exhibition to find out more. Striking scientific photography, concise copy and clever use of colour ensured the effectiveness of this simple advertising campaign. We created a number of design concepts, and our client was so happy with them all that they asked us to choose the one we felt would work best to achieve their objective.